Idolz are a platform toy concept a little different than the rest: they do have articulated feet & arms, and they do have accessories, but what sets them apart from the rest is the fact that the apendages are removable and the Idolz can stack on top of one another. I think what got NEMO going was the endless totem-pole-esque opportunities this platform offered him as a customizer. Idolz are about 3 inches tall and cost $9.99 each. Gruntor (the green camo design in the front of the pic below) is the first design that Idolz made, but I bet you could contact them and inquire about DIY blanks. I know for a fact that Damien, the president of Idolz Toys, has a few blanks in his office. If he runs out and there are enough requests, I think he could be convinced to make another run of DIY blank white versions to sell alongside the future colorways. The future colorways are detailed on the Idolz website here. 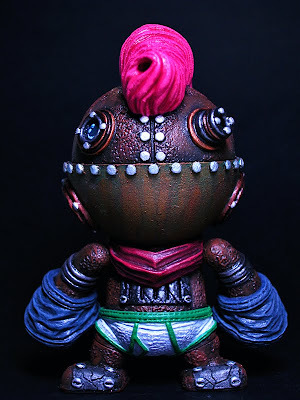 If you want to find out more about the Idolz, check out their website, read Gruntor's blog, and friend him on Facebook! Gruntor even sends out the occasional tweet. His username is gruntor, of course. 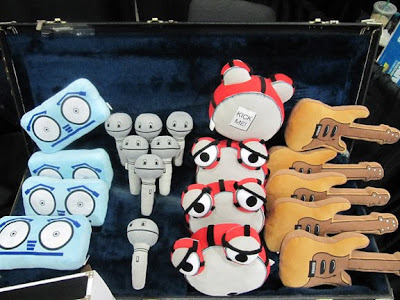 One of the standout new lines of plushes I found at Toy Fair were these super-soft Band Mates plushies in the shape of musical instruments. From left to right, they are: DJ MC, Mike, Tom & Axe-L. They retail between $14.99 and $19.99 each and you can read their backstories, check out the web comic, download wallpapers, and find out more about the cool people behind this line of plushes on their website. I'm digging DJ MC the most, I think. Which one do you like best? Drop us an email or leave comment! 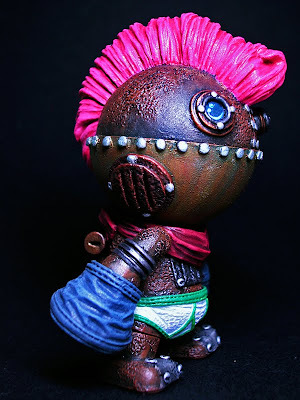 Check out more pics of this amazing piece on NEMO's blog. I believe Toy Fair will be auctioning this piece off for charity. We have a plush 6" Domo that lives above our microwave in our kitchen! Every morning I am greeted by a Domo as I make my coffee. So of course one of my first stops at Toy Fair was the Dark Horse booth where they were exhibiting the upcoming Domo mini figure series! 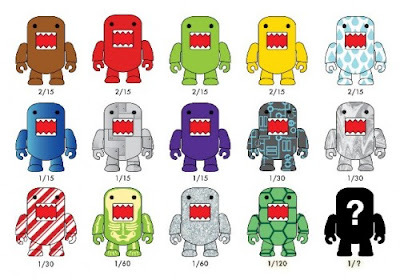 Domo 2" Qee Series 2 is a series of 15 different blind-boxed mystery figures. 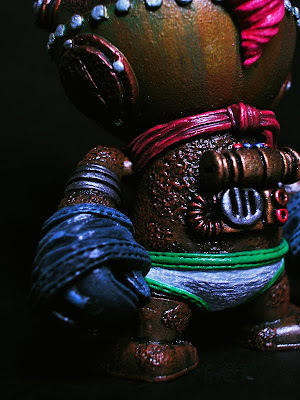 There will be 5 flocked colorways, and also a beautiful tear-drop design that reminds me of the Triclops Rainy figure from the UK Dunny series. There's one that looks like metal plates, one that looks like a turtle shell, one that looks like a circuit board, and one that looks like a skeleton, in addition to several others. In short, a whole mess of interesting designs! I believe the blind-box Domos will sell for $7.99 and the blister-carded Domo figures will sell for $8.99, although I'm not 100% certain. 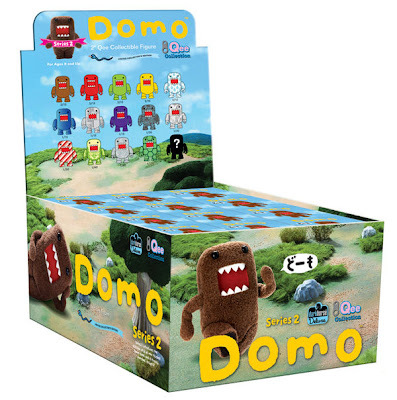 Of course we will happily sell open box series 2 Domo Qees at reasonable prices if you like buying that way. Also on display in the Dark Horse both were the upcoming 7" Domo Qee figures, most notably the Skeleton, Grass and Wood Grain colorways, which will retail for $79.99 each. "Candice & Alison were commissioned by MINI to design and produce the Canadian launch of the MINI Beachcomber concept car at the 2010 Canadian International Auto Show (CIAS). The theme concept was a 1950's Beach Tailgate Party which included Pin up style models with era inspired costumes. Adding to the beach party theme, Candice & Alison approached me to have Lil'G accompany the models showcasing the display area. Everything went amazing, the MINI Beachcomber - concept car was very well received. The models (Jon, Vlada and Caitlyn) were all decked out in their beach wear and looked the part of 50s beach babes and dude. With Lil'G at their side as they showed off the new car from MINI. Getting ready for the event took a lot of work. The Lil'G prototype wasn't fully ready for the event, so I had to have new parts rapid prototyped for the back section. Creating the slot for the MP3 players to be inserted into. Industrial Designer Jason Nip (DesigNet) was a large part of getting Lil'G up to speed, together we brought Lil'G to what it would be on store shelves. MINI/Candice & Alison requested that it be a full working model as it would look at retail. It's really wonderful that MINI/Candice & Alison would recognize a designer product such as mine. It shows that designer toys are ready to break into other markets and be accepted by the consuming market, and not just by collectors and enthusiasts. I hope this event inspires other to push for amazing possibilities such as this. Put your work out there, be unique, positive, creative and see what happens!" You can visit Jason Dollin's website here, find out more about the Lil'G Boombox here, follow him on Facebook here. 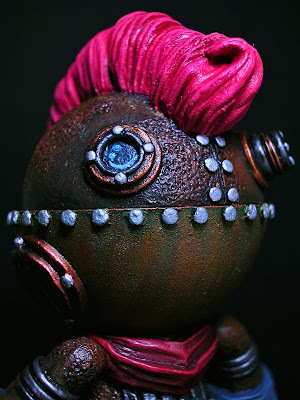 "Inspired by the steampunk and punk-rebel culture, this piece is entitled steam-punk. A representation of flamboyance and rebellion, the piece explores the underlying need for approval and acceptance that is shelled within attention-seekers." More pics can be found at his blog and on his flickr. Brand new from Max Toy Company, arriving in stores in March. 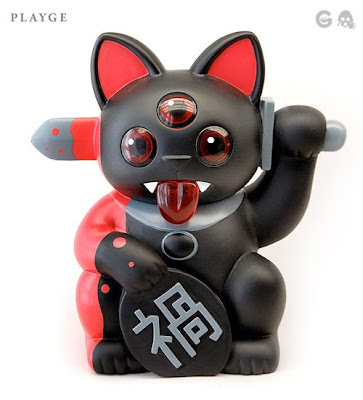 This new series of mini kaiju toys features 5 five-inch characters from Mark Nagata’s original line-up, shrunk down into a super deformed style. High quality, made in Japan! 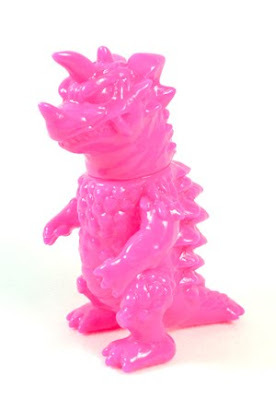 This first run of Captain Maxx Mini Kaiju figures is in sold pink color. Because they mentioned that, I am assuming there will be follow-up series in other colors. Limited edition, retail price will be $14.99 per piece. 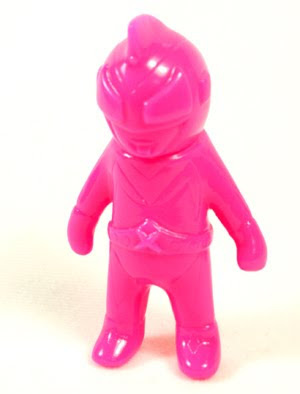 Email us at tenacioustoys@gmail.com if you are interested, we have to get our preorder in soon if we are getting these. Whether you've customized toys before, or you're new to the game, the Delicious Drips crew will be happy to help you get started. If you already have a toy to work on, they welcome you to come hang out and perhaps help other aspiring artists. If you don't have a toy, for just $10 you get to pick a DIY toy of your choice between any of the Mini Munnyworld figures, DIY Skully, or Toy2r BabyQees. 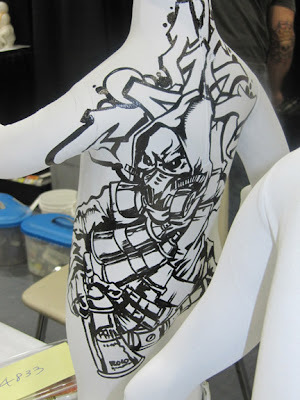 They will also supply you with paints, sculpting mediums and all the tools you'll need to make your project rock out. The workshop will be held at Indie Industries, 218 Columbus Ave., San Francisco. 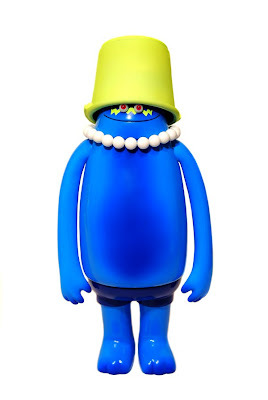 The T9G Shyly Blue figure by intheyellow will retail for $75. Email us at tenacioustoys@gmail.com if you are interested, we need to get our order in by the end of Feb.
64 Colors' Marshall Zipper Charms in stock now. 5/8 inch (1.5cm) tall, with metal clasp and a lanyard so it can be attached to a zipper, keychain or cell phone. Only $3.95 each per blind box. 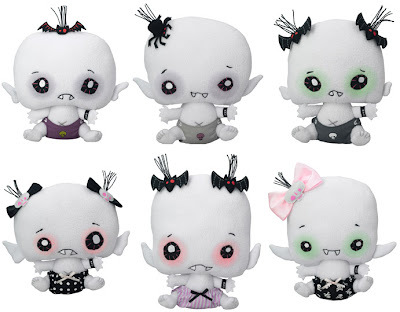 One of the first gems of Toy Fair I found was the Vamplets line of 7- to 8-inch tall baby vampire plushes by artist G-Ra. They retail for around $15 each. There are currently 6 characters available: (starting at upper left and moving clockwise:) Burton Creepson Jr, Cadaverson Nightshade, Count Vlad Von Gloom, Midnight Mori, Lily Rose Shadowlyn & Evilyn Nocturna. 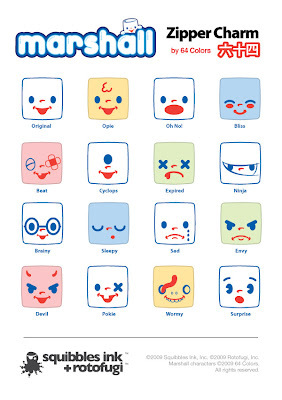 There will soon be companion animals to go along with them. There's also a Disappearing Bottle of Blood accessory for the Vamplets for just $4.95. You can explore the backstories and the extensive world of the Vamplets here- there's lots to see on their website! Vamplets set up a great cross-promotion with the Toy Fair: they had a second booth in the back where you could donate blood, and Vamplets would give you either a special-edition plush or a special Vamplets t-shirt as a gift for your generosity. We're really diggin these cute/creepy plushes; email us at tenacioustoys@gmail.com if you want to see Vamplets in our store! They really are very cuddly and huggable, I can personally attest to that. 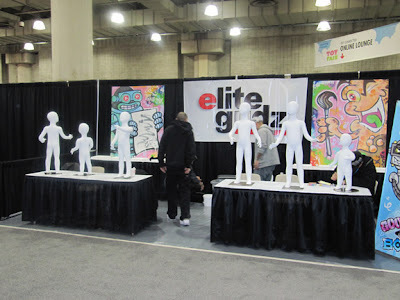 I was really excited when, at the last minute, I heard that the artists from Elite Gudz had been tapped to perform live art and customization in the Designer Toys aisle of the NY Toy Fair! The platforms for this project are the Mannequinz you see in the following shots. Elite Gudz, headed up by street artist/designer/entrepreneur Phetus, is a Long Island, NY-based creative studio. One of their many projects is the Concrete Immortalz comic book. Their roster of artists includes some of the best and brightest of NY-area street artists from all walks of the art world: Phetus' resume spans the fashion, design & comic book worlds, Rolo works in illustration and fashion, Mr Den is a tattoo artist, sculptor & painter, Brian works on comic books and handles PR for Elite Gudz, Narek's a digital painter & illustrator, my buddy NEMO, of course, is an independent sculptor & painter extraordinaire who I've mentioned countless times. 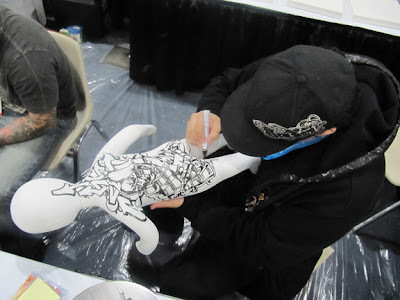 Toy Fair got in touch with Elite Gudz not so long ago and offered them a spot so they could show attendees some art in action. I have to say, their booth does lend quite a bit of street cred to an otherwise all-business convention. 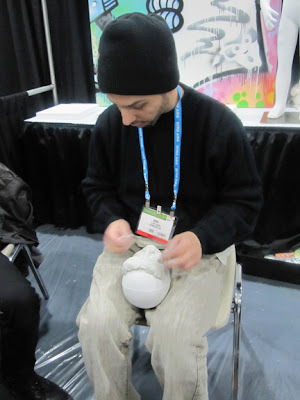 If you can, stop by booth #4954 on the lower level of the Javits to check out the artists at work! 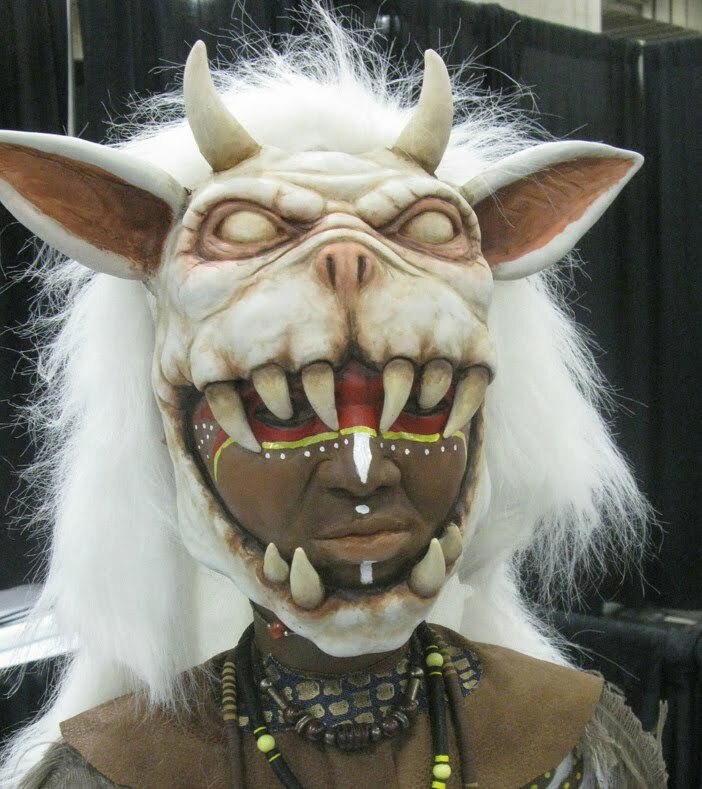 I am sure Elite Gudz will be posting up pics of the finished Mannequinz on their website after Toy Fair. You can also fan them on Facebook.